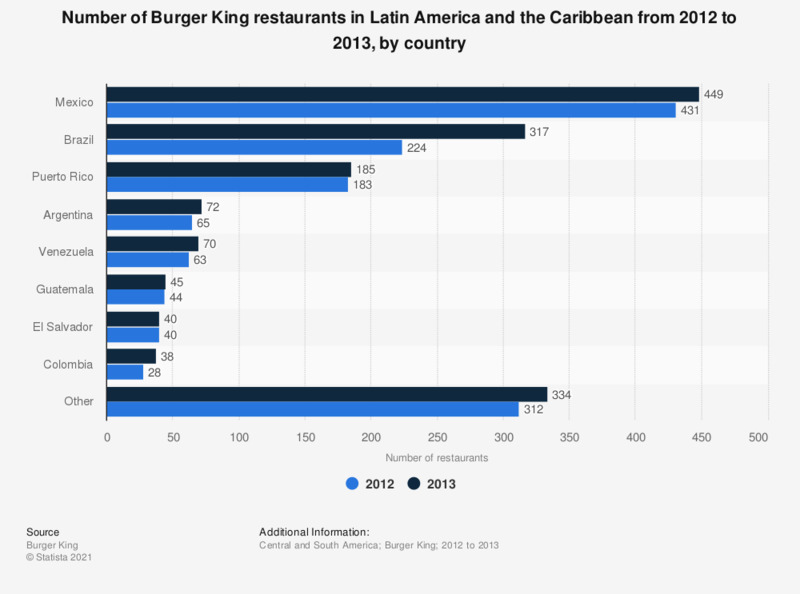 This statistic shows the number of Burger King restaurants in Latin America and the Caribbean in 2012 and 2013. In 2013, there were 449 Burger King restaurants in Mexico, 317 restaurants in Brazil and 185 restaurants in Puerto Rico. Burger King merged with Canadian coffee chain Tim Hortons under parent company Restaurant Brands International in December 2014. Restaurant figures for Restaurant Brands International can be found here. Statistics on "Restaurant Brands International"
Quick service restaurants in the U.S.
Food delivery industry in the U.S. Eating out behavior in the U.S.